Tom, Dana, and I just returned from a whirlwind trip to Minneapolis/St. Paul. The 10 interviews we conducted offered great insight into this significant, though lesser-known, community in the Midwest. The Twin Cities was the site of the Military Intelligence Service (MIS) language school at Ft. Snelling and drew thousands of Japanese Americans to the region during World War II. Many came to Minneapolis from camp, joining their sons and brothers who were recruited for language and intelligence training. Originally from California's central valley and incarcerated in Gila River, Helen Tsuchiya followed her brother to Minneapolis in 1943 and was joined by her Issei parents when the camps closed in 1945. Helen's family, like many, decided to remain in Minneapolis after the war because they had nothing left in California. Others, like Mary Yoshida, came to the Twin Cities with no direct connection to Ft. Snelling. Mary answered a newspaper advertisement and worked as a domestic for a wealthy Minneapolis family while she saved up money to return to college. After college, Mary became a social worker for the YWCA and organized activities for teenagers around the city. Yet, the language school still influenced her life, as she and her Nisei friends would attend weekly dances with the MIS soldiers. In fact, that is how she first met her husband. Many of the Minneapolis narrators also came from farming backgrounds. Helen's family operated a grape farm in Parlier, California, while Mary's family was involved with truck farming in Medford, Oregon. The Alien Land Laws prevented Japanese immigrants (who were also ineligible for citizenship) from owning property, leaving Issei farmers with no legal protection. Bill Hirabayashi recounted his family's 1920s court battle against the State of Washington, which later went to the Supreme Court, over land purchased by White River Gardens, a corporation formed by three Japanese American families in Thomas, Washington. Even though the Issei founders placed the property in the name of their eldest Nisei child (a U.S. citizen), the court still found the families in violation of the Alien Land Law and confiscated the land. 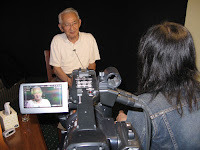 Bill, younger brother of Grant Hirabayashi (interviewed by Densho in 2006), also talked about his childhood growing up in Thomas, Washington and resettling to Minneapolis after WWII. Like Helen, Mary, and other narrators, Bill told us that his family never returned to the West Coast because they lost their farm, home, and livelihood during the war. In total, we interviewed 10 people and recorded over 17 hours of footage. Stay tuned for a recap of Tom's interviews.